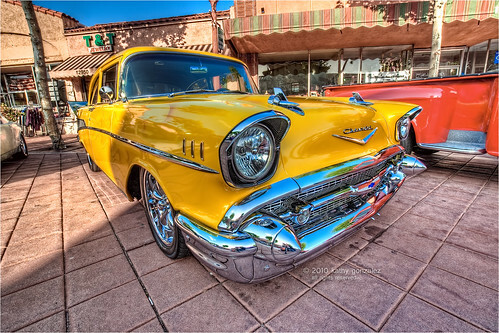 this chevy bel air was the color of a vivid yellow egg yolk. one with flames. down the sides. guess that would make it a fast breakfast to go. the flames were just a bit darker than the body paint, so they might be difficult to see here, but they were cool. love the torpedo bumpers on these; look like they could do some damage if you're unlucky enough to tangle with them. parked half in / half out of the sun / shade, i just hope for the best. deal with what it is, and take a lot of pictures...maybe one will turn out o.k., like this one.